Free Knitting Pattern: Tweedy Eyelet Scarf! This is a great beginner project to learn simple knitting techniques like YO increases and K2tog decreases. The result is a quickly knit and simple eyelet scarf. 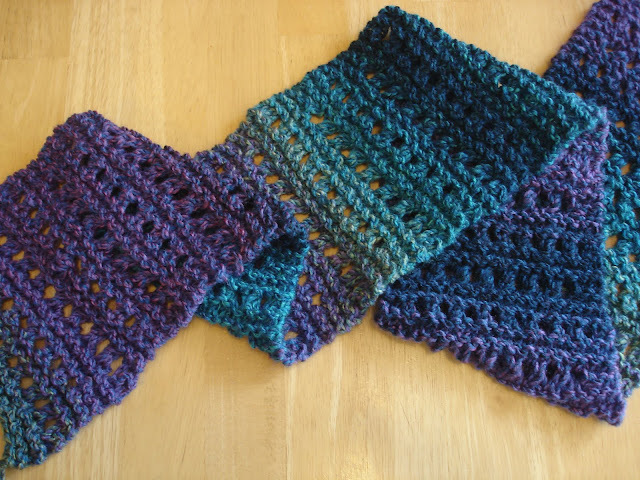 The variegated yarn adds interest and makes for an easy yet engaging project. Rpt rows 1-5 until desired length, ending on row 4. Please note: If you enjoy the pattern, please link to it, but do not copy the pattern to your own website or blog (including other languages). Thank you! I may have to try this. It's lovely. Great, I'm sure it will look great! And thanks so much for your kind comments! @ CsqDesgns...I enjoyed doing this because it was simple but engaging, thanks too! Love this pattern, would it work with a delicate yarn? What a lovely idea! I think it would be beautiful! Just to be sure, I would do a test swatch to see what it would look like...you might have to play around with the needle size too. I'm a beginner to knitting. Thank you for the video. I don't knit. Is there a crochet version of the Tweedy Eyelet Scarf? Hi Jennifer, I have just found your blog and have bookmarked a few of your patterns/projects to create, but only after I finish crocheting my blanket. I was wondering if you knew what wool you used for this project, it really is lovely. P.S I love your name, I learned to knit and crochet from my Mum and her name is Jennifer too. Just completed your Tweedy Eyelet Scarf to donate to a woman's shelter for a Knit in Public Event... will be sure to reference you and your pattern name... Thanks for this great pattern! Wonderful, kudos to you for contributing to a good cause. Thanks for the reference too! 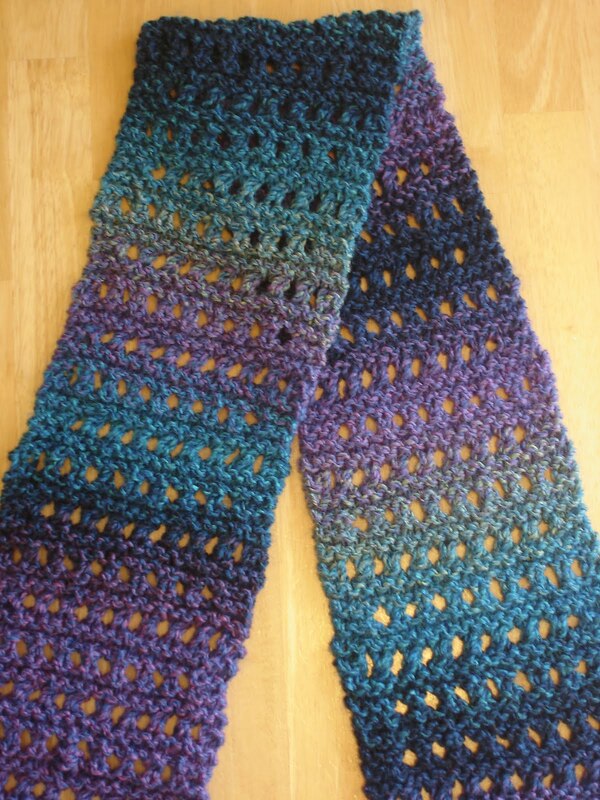 Hi Jennifer, I am making this with a Noro yarn (for myself). I had one skein left over from a project, so we shall see how far it goes! I love, love, love Noro!! That will be gorgeous! I found a skein of unlabeled novelty yarn--gorgeous but very thin. With size 7 needles, I followed this pattern and have completed 10 rows, but unlike your scarf, my stitches slant to the left. It's very pretty, but to add interest, I wondered what would happen if I did the next 10 rows with YO, P2tog. Would the stitches slant the other direction? I'm afraid to try because the novelty yarn is very hard to unravel if I mess up, and I'm not good at picking up knitting stitches. So I thought I'd seek your advice before attempting it. Thank you! Hi Wyominggal! Than does sound very pretty! It does seem as if it would behave in the opposite way, but just to make sure I would make a swatch before you move forward just to be sure. That way you won't have to take anything apart (yikes!) or have to commit to if it didn't look the way you want it to. Hope that helps! This looks lovely! I'll try this when I have my ordered hats and scarfs knitted that my friends asked me to knit for them! It will be after Christmas but I wonder if it would be difficult to knit a hat to match your scarf. This of course will be for me or my 8 yr old little girl! Hi! I have tried starting this scarf two times, and each time I end up with an extra stitch after Row 5. Any thoughts about what I might be doing wrong? It just means "knit two stitches" so at the beginning on the row on row 5 for example, knit the first two stitches of the row, then proceed with the rest of the row. Hope that helps! I, too, end up with an extra stitch after row 5. I was wondering if i alternate between yo,k2tog and k2tog,yo every 5th row it would fix the problem. In eyelet rows, sometimes it can be easy to add an extra yo before those last two stitches. Before working the last two stitches of the row, be sure to end with the "k2tog" not an additional "yo" Hope that helps! has anyone tried this on loom knitter? If you k2tog, would you be decreasing? Yes, the k2tog is a decrease stitch, but you are also adding a yo, so that keeps the stitch count the same for each row. Just finished this scarf. I love it. I have to make me for myself. First ne was a gift now for me. Made a cowl from this bit shorter.... twisted twice and sewed up....added couple of Pom poms. Thank you. What is the pattern repeat, can you tell me please, I want to make a wider than 20 stitches scarf. Thanks.